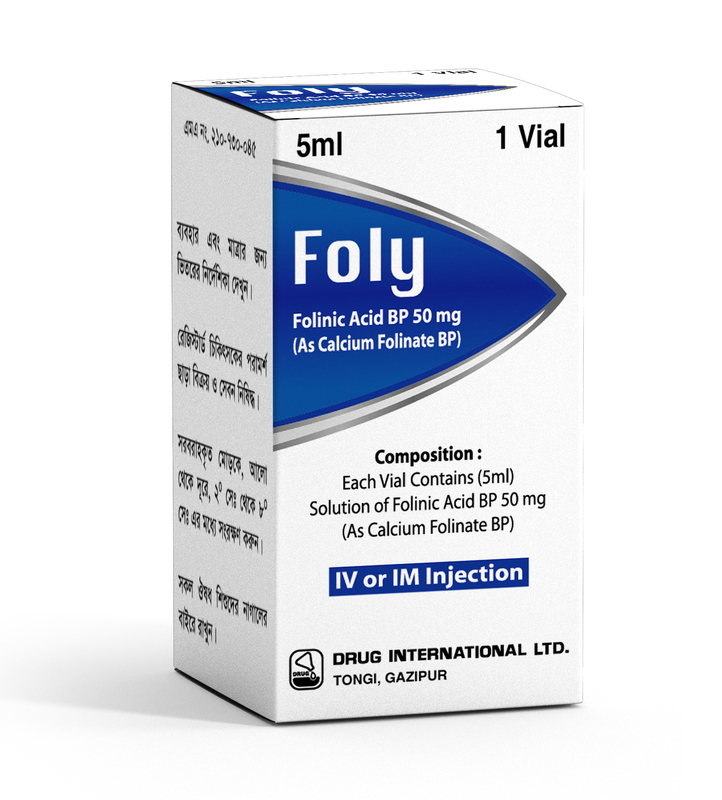 Composition : Foly Injection : Each vial (5ml) contains Folinic Acid 50mg as Calcium Folinate BP. Indications : It is indicated to diminish the toxicity and counteract the effect of impaired Methotrexate elimination, treat the Megaloblastic anemia due to folate deficiency, as in sprue, nutritional deficiency & treatment of the Megaloblastic anemia of pregnancy and infancy. Calcium Folinate injection is also used in combination with 5-fluorouracil in cytotoxic therapy. Dosage and administration : Foly Injection : It is given 12 to 24 hours after the antineoplastic drug. Doses of up to 120mg may be given over 12 to 24 hours by intramuscular injection or intravenous injection or infusion. Megaloblastic Anemia: The dose should not be given 1mg daily given intramuscularly. Or, as directed by the registered physicians. Use in Pregnancy and Lactation : There are no adequate and well-controlled clinical studies conducted in pregnant or breastfeeding women. It is not known whether this drug is excreted in human milk. Because may drugs are excreted in human milk, caution should be exercised when Calcium Folinate is administered to a nursing mother. Packing : Foly Injection : Each box contains 1 glass vial of 5 ml solution.